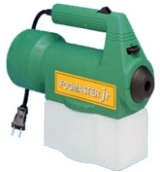 The Fogmaster jr 5330 fogger is a reliable, less expensive fogger for smaller applications. When a smaller or less expensive fogger is needed, consider the jr. The jr -- for those "in between" jobs -- too small for an industrial unit, too large for a trigger sprayer or pump-up.